- Custom images for the buttons. - State (enabled/disabled) for the buttons. Hope that it will work properly and will be useful! P.S. After publishing found an issue with VSTO project ("No such interface") - should be fixed now. Can't use it myself, unfortunately, as I've uninstalled Visual Studio here completely. from me also the highest appreciation and thanks for the contribution. I tried the COM version and somehow got stuck, I managed to get till the intaller in "C:\Users\Yacine\Documents\Visual Studio 2013\Projects\VisioPanelAddin1\VisioPanelAddin1\Setup\bin\Debug\x64" and it runs, but I cannot find it in Visio itself. I seem to be missing an important point. Try to just change to x86 configuration. Most probably that's it. Dont know why Visual Studio sets x64 targets by default. Just select platform to be x86 in the combo box in VS and rebuild. You should get the installer in the x86 folder. Probably need to add check for x86/x64 Visio version somewhere in installer. Also the installer has no UI now, that's probably not okay, would it be better if it had? UI? sure, but a kind of instruction file (readme) could suffice as first help. Myself and many other forum members would certainly also appreciate a more substantial article or a youtube video on building visio add-ins. There are still those virtual beers floating around (http://visguy.com/vgforum/index.php?topic=6012.msg24702;topicseen#msg24702). I owe you a barrel. Chris is near Munich. I'll be in charge in Dusseldorf and surroundings. Tell me when ever you come nearby. Sorry, but here is already the second question. Having modified the form in VS and rebuilt the solution, how do I refresh it? There is still the previous solution showing up. Probably now the installed version is always started. 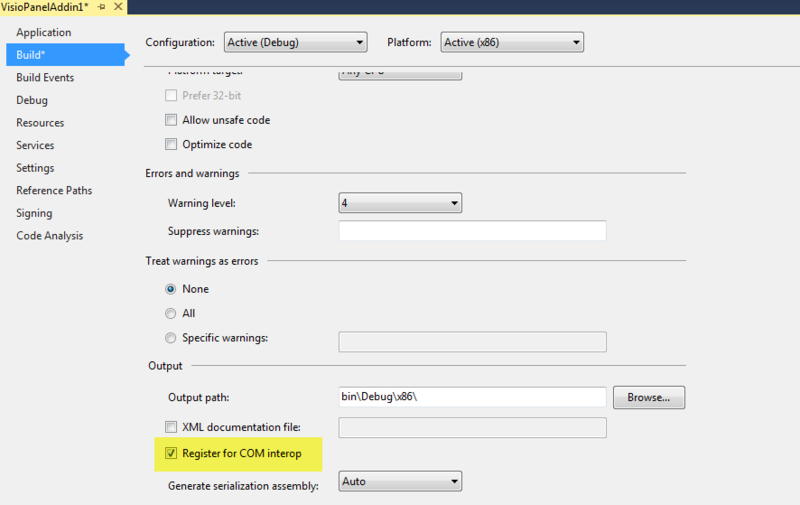 In the Addin's project settings, set the "Register for COM Interop" checkbox. Also set to start Visio as executable (see below), so the VS does not complain that it cannot start a DLL, but just start Visio. 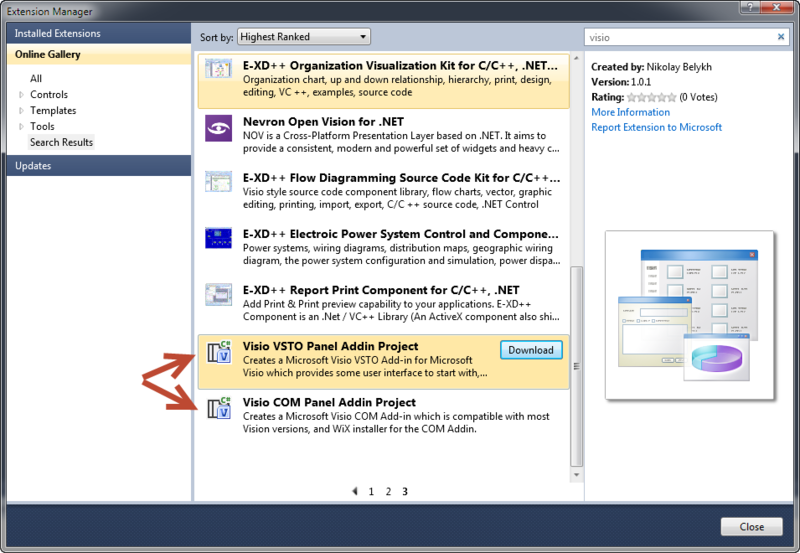 Then VS will register the debug version, and Visio will load it instead of the installed one. When you are done debugging, build the installer. Just some quick thoughts before even testing the new uploads. - VB.NET instead of C# is certainly something that will attract more people. - With your project you are bringing to the visio community a possibility to tweak visio in a much richer and deeper way. - Being a novice in Visual Studio, I am still struggling with basic structures. I mean knowledge about where (and how) to implement a "visio" class, where one would store the document, page and shapes data; the routines handling the shape inspection and the modification of shape cells; etc. PS: how can I de-install a plug-in? From Visio: add-remove programs, uninstall. From Visual Studio: Tools -> Exfensions & Updates -> Uninstall. Found it in the control center (is that the right name in english?). But I found several copies of the addin. That should not happen. it's embarassing for me, because you must get the impression that I am too lazy to search. Do you have an idea about what could have caused the attached error? Basically, Visio starts just fine, no errors, but no toolbar is created. Update: I messed too much around. After having desintalled the plug-in, I manually deleted also the toolbar. Now neither VB nor C# create a new toolbar. Update 2: If I install the VB plug-in, then I get the toolbar, but there doesn't seem a way to get it in debug mode. Sorry for the inconvenience, not quite sure what the issue is. 1. Uninstall everything (from add-remove programs). 5. Set the checkbox "Register for COM interop" in the project settings. 6. Rebuild the project again. 7. Press F5 to start debugging. Which operating system / Visio version do you have? Tomorrow I'll try to make a short Video how to make it work..